WELCOME TO THE OFFICIAL WEBSITE OF THE STRINGBENDERS: Country Music With A Rockin' Attitude! One of the things that the band prides itself on is the diverse backgrounds of each member. This page is dedicated to crediting the artists that made each member, the musician / person that they are today. This page is a work in progress as the band puts their thoughts together on some of the influences that make the Stringbenders unique. 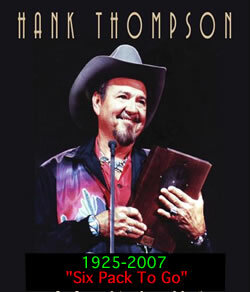 Hank Thompson was an influence on Tracy as one of his favorite country swing tunes is "Six Pack To Go." This song is a staple as part of the Stringbenders show. In fact, many Texas country diehard fans request that particular song of the Stringbenders. His songs will live on in the hearts of country music fans and his influence will continue. Thoughts from Joe - "I always remembered listening to Freddie as a kid on AM radio. I was fascinated by his English and Spanish bilingual lyrics. His resurgence with the Texas Tornados brought him back to the forefront as an influence to my musical style. The Tornados had the perfect blend of the Texas sounds, country, rockabilly and Tex-Mex." "Freddie had several number one hits on the billboard and country charts in the 1970's. This is a huge accomplishment for anyone. 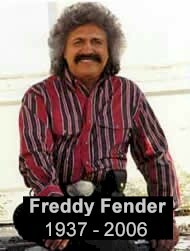 Especially for a Hispanic Texas artist from the Rio Grande valley. He stayed true to his roots and never forgot where he was from despite all of his success. For that, I will remember him the most." More influences coming soon from all of the band members. This website content (c) 2006 by Tracy Park. All Rights Reserved. This site is best viewed with Internet Explorer.